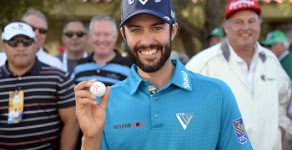 BELFOR congratulates Adam Hadwin on his first PGA win at the Valspar Championship and his qualification for the Masters Tournament. In January, Adam Hadwin shot a 13-under 59 in the CareerBuilder Challenge at La Quinta Country Club in Palm Springs for the ninth sub-60 round in PGA Tour history. In total, Hadwin made 13 birdies, matching the all‐time single round record set by Chip Beck, who broke 60 back in 1991. He became just the fourth player to break 60 on a par‐72 course. Hadwin is the first Canadian - born in Moose Jaw, Saskatchewan and grew up in Abbortsford, British Columbia - to break 60 on the PGA Tour. "One of the world’s leading disaster recovery and damage restoration companies, BELFOR Property Restoration has been in my corner since I turned pro in 2009, and they’ve been an invaluable part of my team. Through ups and downs, they have been unwavering in their support, and unrelenting in their friendship. I wish every young pro could be as fortunate as I was to team up early with such an amazing company and group of people," Hadwin said.